Stewartia pseudocamellia is an interesting tree not often seen in New Brunswick landscaping. It is a member of the Tea family, related to other flowering shrubs like Franklinia and Camellias. In the wild it can reach 20 to 40′ tall but most cultivated specimens remain 12′ multistem shrubs to better appreciate their large cup-shaped flowers. Its patchy bark gives it an interesting winter characteristic. 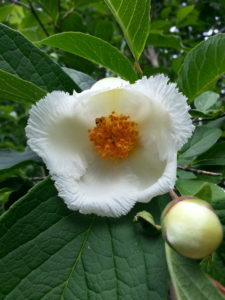 Stewartia is at the limit of its winter hardiness in Fredericton and it can be damaged by late frosts and deep freezes. The inclusion of Stewartia on a property should therefore be a purposeful decision, not something selected on a whim. Landscaping is more than mowing grass and moving stones – it requires an artist’s eye and an architect’s mindset. 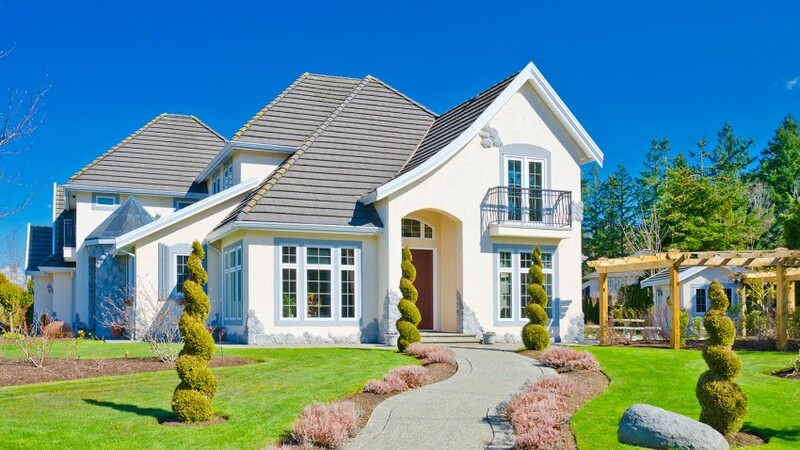 Plants should be selected to appear as a harmonious community, rather than individual stand-alone specimens, and chosen to accentuate the grounds and the structures (houses, businesses, cottages, etc) rather than hide them. Ease of care, resistance to pests and diseases, tolerance of urban stressors (heat, salt, air pollution), and suitability for the climate are all important factors as well. When designing a landscape for yourself, consider how much time you are willing to invest in care and upkeep of your plants. Think about what it will look like in all seasons, not just the height of summer. Find out what the allergy rating of a plant is, if environmental allergies are a concern (yew and oaks can be especially troublesome in this respect). If you have pets or young children, inform yourself of your plants’ toxicity. And if this seems like a daunting task, you can always give your friends at Treecologic a call – we are happy to design a planting plan with you!